When you think of Marshall, chances are you are imagining some of their flagship models, both current and older ones. However, some of their most interesting amplifiers belong to a very unusual category. 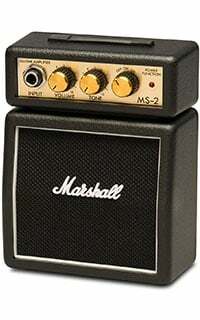 Marshall MS-2 Mini is a micro stack that was designed to be ultra mobile. If you are looking for a portable little practice amp, you will hardly find a better deal than the MS-2. Let’s take a closer look. Just as one can expect, micro portable amps don’t generally have a lot to offer in terms of controls. The same applies to the Marshall MS-2 Mini. Going from left to right, we see an input jack for your guitar followed by three knobs. The first one is your volume control. Right next to that, there is a tone knob that serves as a mini EQ of sorts. The last knob is the actually on/off switch but it is also used to toggle between channels. That’s right, you get Marshall’s OD channel even in such a small format. These are the only controls you have to work with. As you can see, it is a simple layout without much clutter at all. One glance at the MS-2 reveals just how awesome this thing really is. They have designed it in a way that makes it look like a standard Marshall stack, only miniature one. Build quality is on point, which is to be expected from a brand such as Marshall. MS-2 packs a whopping 1 Watt of power. It may not sound like much but that is more than enough power for what this thing was designed to do. As expected, this is a battery operated amp with a headphone jack and a built-in speaker. A single 9V battery will give you enough juice for decent practice sessions, even at higher volumes. MS-2 comes with a belt clip on the back side, making it easy to just hook it to your belt and rock on. Here’s where things get really interesting. No one expects a small micro amp to deliver a super high quality of tone. However, MS-2 nearly does that in a package that is the epitome of portable. Cleans are not shallow, and even have a bit of that twang to them. Once you hit OD, you get the very same Marshall overdrive we are so used to. Naturally, it is going to be a bit thinner, but not to a point where it is hard to the ears. For a 1 Watt amp, this thing is loud. You can easily use it for busking and it will get you the volume you need. That is pretty amazing considering the size of the built-in speaker. 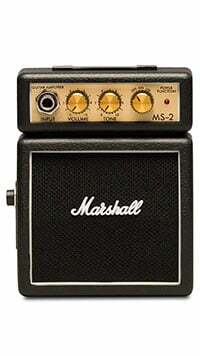 Marshall’s MS-2 may not be their most popular amplifier, nor the best one. However, it still follows their quality standards and delivers a pretty mighty sound for something so small. The best part about it is its price. This thing very affordable, making it a great choice for guitarists working with a tight budget. In terms of portable guitar tone, this is about as good as it gets. 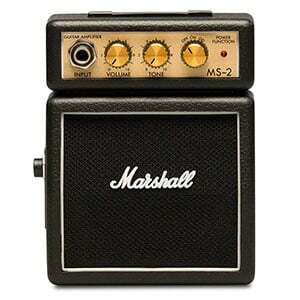 For more info about the Marshall MS-2 Mini Amp, click here. For more Best Guitar Amplifiers Portable And Mini Amps, click here.